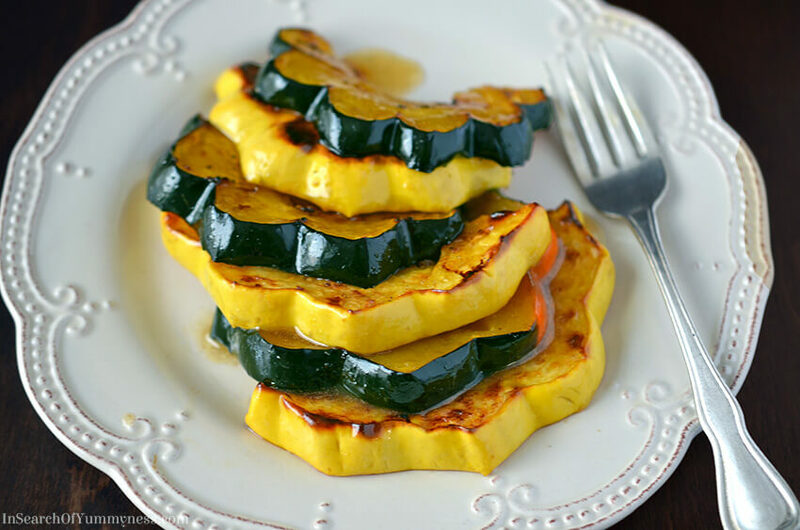 This vanilla and cardamom glazed acorn squash recipe is a unique and delicious side dish. I love planning our family dinner for Thanksgiving with my mom. We either buy a whole chicken or turkey to roast, and then serve it along with stuffing, gravy, cranberry sauce (or jelly) and a vegetable side dish. Pretty standard stuff, but since we only eat like this at Christmas and Thanksgiving, I get excited about it! My go-to veggie side dish is usually Roasted Brussels Sprouts, but every once in a while I like to change it up. Sometimes we roast broccoli, sometimes we make glazed carrots, but this year we’re trying something very different. This glazed acorn squash dish is from one of my favourite cookbooks, Fast, Fresh & Green by Susie Middleton. If you don’t really love vegetables, but you want to eat more of them, I highly recommend buying this book. Most of the recipes are easy, and they are all really flavourful. This might sound a bit dramatic, but this book really changed my perception of vegetables! Anyhow, we decided to try making these roasted vanilla and cardamom glazed acorn squash rings the other day and they were so delicious! I’ve never put vanilla on a vegetable before, but it totally works! The combination of butter, maple syrup, cardamom and vanilla adds a subtle sweetness that compliments the delicate flavour of the squash. This dish is really delicious as a side dish for chicken or turkey, so I think this is going to be on my regular rotation of side dishes for Thanksgiving and Christmas now. Plus, it looks fancy enough to impress guests, but is actually really easy to make! Susie says that if you want to serve these for Thanksgiving, you can put them in the oven when the turkey comes out because they cook quickly. Also, if you need to double or triple this recipe, just use 1-2 more baking sheets and rotate them halfway through cooking. You’ll want to use pure maple syrup, not pancake syrup, for this recipe. Pancake syrup will be too sugary and won’t give the right flavour. Also, if you’ve never cooked with cardamom before, you should look for ground cardamom at your grocery in spice aisle. Not only is it delicious in this recipe, but it’s great in stews and chilis too, like my white turkey chili. 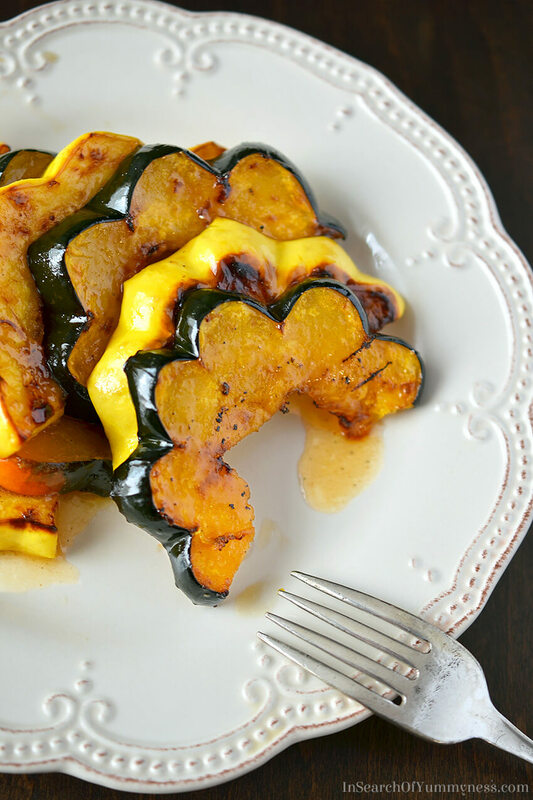 Since you leave the skin on the squash rings, it’s nice to use different varieties of acorn squash in this recipe. They all taste similar, but the different coloured skins look pretty on a plate. During the fall months you can usually find not only green ones, but white and yellow varieties as well. The two green squashes I used were sweeter than the yellow one, because the flesh on the inside was darker. That’s always an indication of sweetness in a squash (but sadly you can’t tell that until you cut it). I used a LOT of squash when I made this recipe, but that’s because I needed extra for photographing. The recipe only calls for one squash, but you can double that if you need more servings. 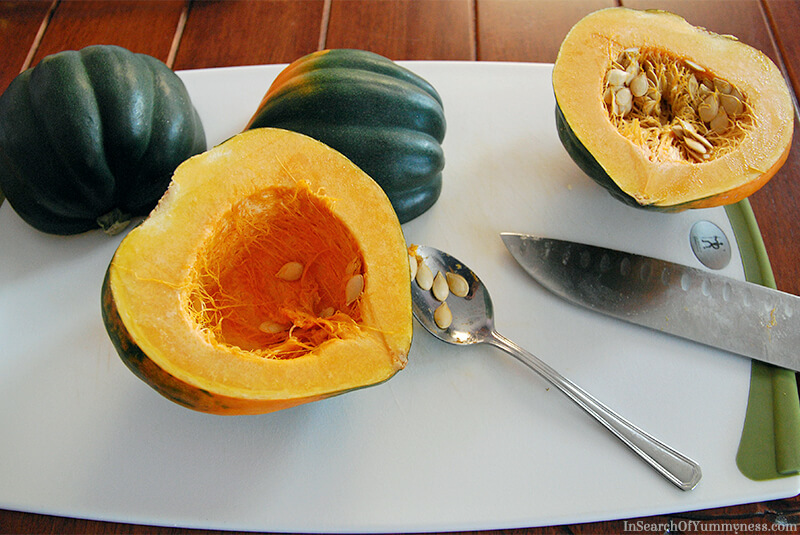 I’m so grateful to Susie for letting me share this glazed acorn squash recipe with you. I know the vanilla seems a bit weird, but, trust me, it’s so good. I hope you give this recipe a try soon, and if you do be sure to let me know what you think of it in the comments below. If you want to learn more about Susie’s cookbooks, you can check out her website here. 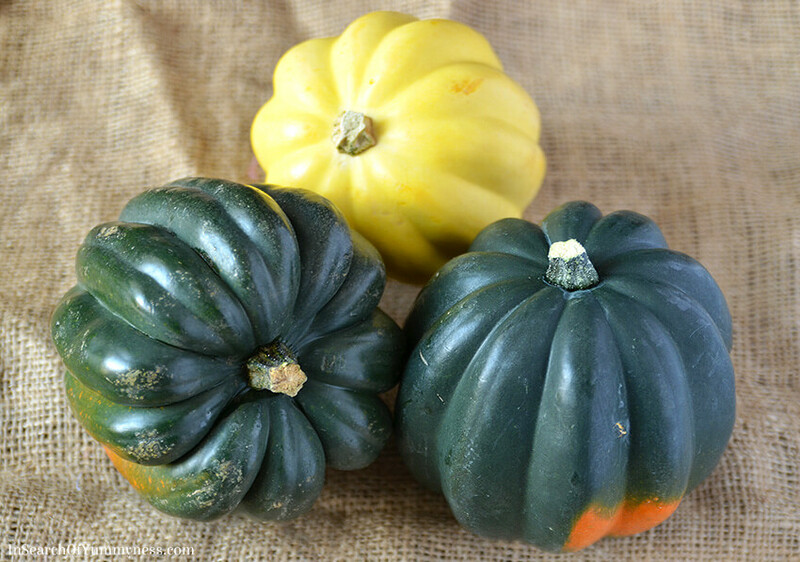 These sweet, buttery acorn squash rings are a great match with oven roasted turkey or chicken. Preheat oven to 475 degrees. Line a large heavy-duty rimmed baking sheet with parchment paper and set it aside. 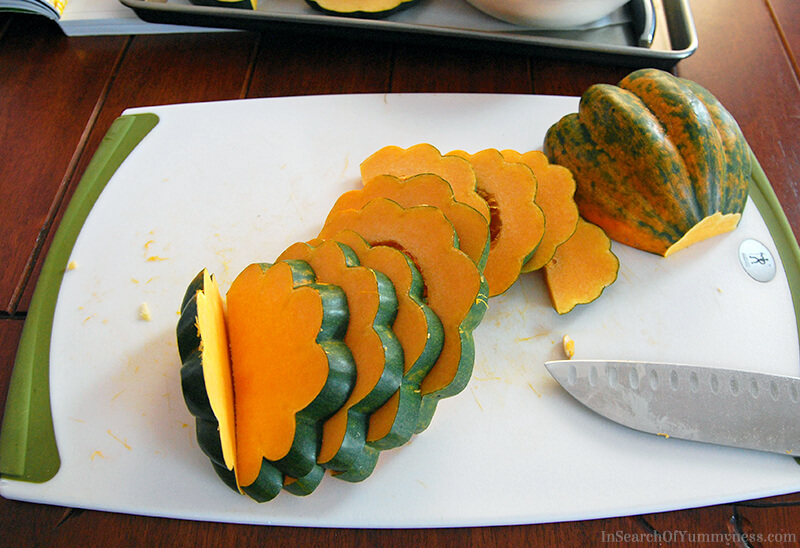 Using a sharp knife, cut the acorn squash in half lengthwise (through both the stem end and the pointy end). Use a spoon to scrape out the seeds and fibers. Put each half, cut side down, on a cutting board and slice off about 3/4 inch from each end and discard. Slice squash crosswise into 1/2-inch-thick half-rings. If you want to, trim away any remaining fibers from the rings by running a paring knife around the inside of each half-ring. Place the half-rings on the parchment paper. In a small saucepan, melt the 2 Tbsp butter over low heat. Remove pan from the heat and add the maple syrup, vanilla, and cardamom, stirring to combine. 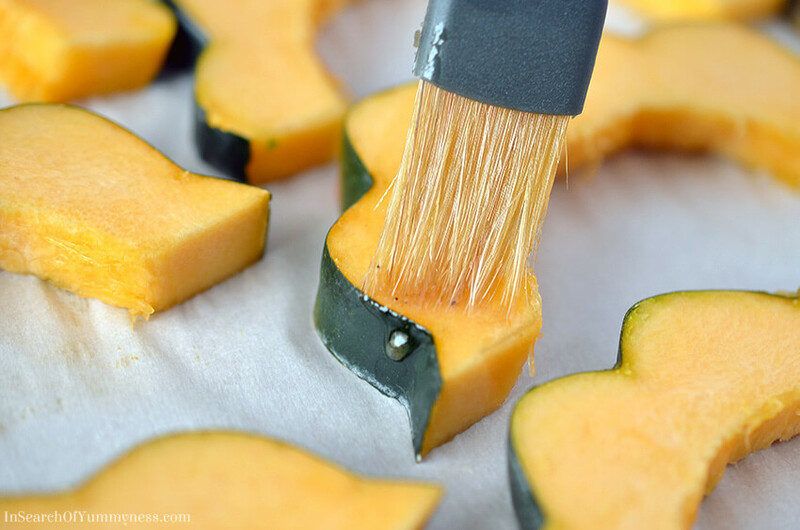 Use a pastry brush to lightly brush squash pieces with a little less than half the butter mixture. Season the pieces very lightly with salt and turn them over. Brush this side with the remaining butter mixture, reserving about 1 Tbsp for brushing on after cooking. If using a larger squash and you wind up with less than 1 Tbsp of liquid, add 1 or 2 tsp more butter to the saucepan. Season the tops very lightly with salt. Roast the squash for 12 minutes in the oven. Use tongs to flip the squash pieces and continue to roast until they are nicely browned and tender, 10 to 12 minutes more. The bottoms of the pieces will be browner than the tops. 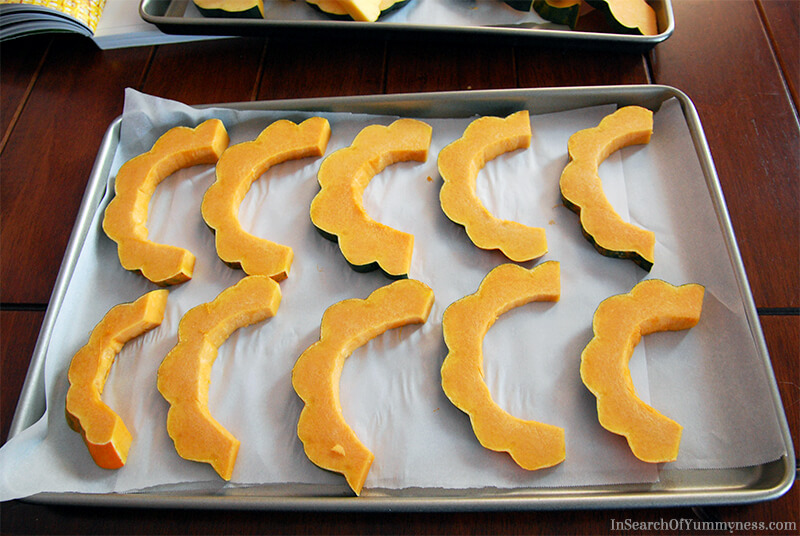 Remove the squash from the oven and flip the pieces over so that the browner side is facing up. Reheat the butter mixture briefly over low heat if needed (or to melt the additional butter). Brush the butter mixture over the squash slices and serve. If you're using the convection setting on your oven, reduce the cooking time to prevent burning! This recipe has been republished from the Fast, Fresh & Green cookbook with permission from the author, Susie Middleton. This recipe is from the Fast, Fresh & Green cookbook. Fast, Fresh, & Green is published by Chronicle Books. This recipe has been republished on this blog with permission from the author, Susie Middleton. This is not a sponsored post. This post does contain Amazon affiliate links.